Led by two-time state-qualifier Makenna Jones, National Trail’s girls golf team expects to challenge for a spot at the state tournament in Columbus at the end the season. PREBLE COUNTY — National Trail’s girls’ golf team will be seeking to make its way back to the state tournament as team, while Eaton will field a full team for the first time. Last season the Blazers finished second in the Cross County Conference and return thee players from that team. As a freshman Jones placed in the top-10 at state and she made a return trip as a sophomore and finished 22nd. Also back is senior Savanna Abner and sophomore Caitlin Gilland. Makena Laird returns after not playing a sophomore. Newcomers this year include freshmen Katelyn Hines, Brooklyn Middleton and Avery Rutan. Early on Jones has been on a mission. “Makenna continues to dominate the early season schedule winning Medalist honors in each of the 4 invitationals she has competed in. We obviously she has her sights set on Columbus, but we want to get the team there this year and compete as a team,” Ferguson said. Last year Eaton played one varsity match while the rest of the matches they competed on the boys junior varsity team. Tim Appledorn has a team comprised of a junior, three sophomores and a freshman. “Last year was a learning year for all the girls and this will be a more competitive year. This year will be a growing year and I expect that we will be very competitive. The ultimate goal will be to have a chance to make it to districts. Its a lofty goal but its obtainable,” Appledorn said. Leading the way for the Eagles will be sophomore Ainesleigh Elstro, who could also see time on the boys varsity team. In addition to Elstro, the Eagles return sophomore Alina Fore, who played on the JV boys team last year and sophomore Carly Bricker, who also played on the boys JV team. Newcomers this year include freshman Kyla Mize and junior Hikaru Sato. 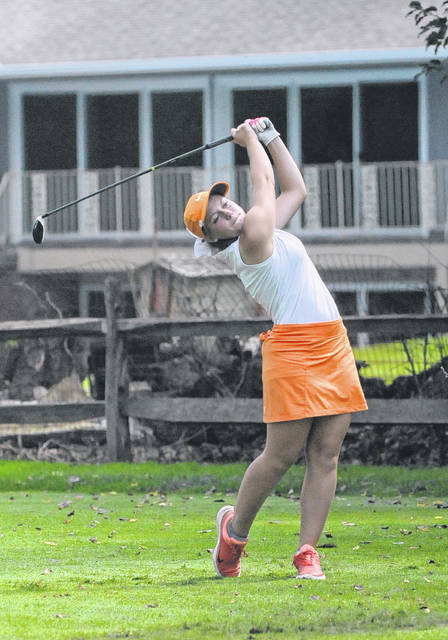 https://www.registerherald.com/wp-content/uploads/sites/41/2018/08/web1_jones1.jpgLed by two-time state-qualifier Makenna Jones, National Trail’s girls golf team expects to challenge for a spot at the state tournament in Columbus at the end the season.